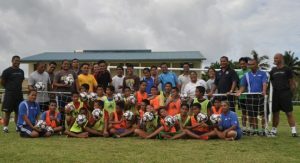 Samoa Football > News > Coaching Course > Samoa hosts National Team Coaches Workshop. This course is designed to give the National Team Coaches support, advice and guidance when preparing their respective teams for future tournaments. 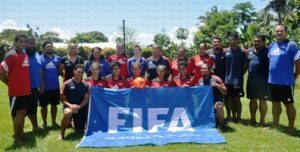 Representing Samoa at this course is Football Federation Samoa Men’s National coach Tunoa Lui and Women’s National Coach Talamasene Saveaalii. Also taking part are the National Coaches from American Samoa, Cook Islands and Tonga. Some of the topics that will be discussed at the course are formations, planning and preparation, coaching structures /roles and responsibilities as well as player welfare and many other key topics. The course will also identify key areas that the National Team coaches have with regards to coaching their teams. The course is being facilitated by OFC Head of Working Group – Elite Football, Colin Tuaa. He is also the former CEO of the FFS. Tuaa brings with him a vast knowledge of the game as both a player and coach having been involved in the game for the last 25 years. Tuaa had represented the All Whites as a player from 1983 to 1988. As a coach Tuaa coached the New Zealand Under 17 boys team at the 2007 FIFA Under 17 World cup in Korea. Tuaa also coached Auckland City FC as well as Young Heart Manawatu. On the course itself Tuaa explained; “This course is designed to assist these coaches by working together with them to help build their knowledge in preparations for the Stage 1 World Cup Qualifier in November“. The National Coaches who are currently in Samoa for the course will lead their respective Men’s National Teams to the First Stage of Oceania’s World Cup Qualifiers campaign for the 2014 FIFA World cup in Brazil. This first stage is scheduled will be hosted by Samoa from the 21 to the 26 November 2011. The winner from the first stage will qualify for the second stage along with 7 other Pacific Island countries to be hosted by Fiji in June 2012. Chris Williams who is the Tongan National Men’s Coach explained the importance of the course; “For us it’s a great opportunity to come to Samoa and to meet the other National Team coaches. In football you are always learning something new, so to be able to come here and to learn from some very experienced coaches is going to be priceless”. Previous Post Business House Heating up.